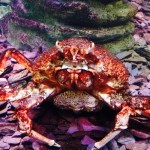 Sea Life London Aquarium is housed in County Hall, between the London Eye and Westminster Bridge. On entry, the first thing you do is cross a glass walkway covering a tank full of sharks. It is a very effective way to get everyone excited for what is in store. The first section of aquarium consists of a long hall lined with individual tanks containing lots of smaller species of sea life including a shy octopus, lobsters and lots of common sea fish (cod, bass, bream etc). 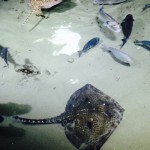 You then enter a larger room containing a vast open tank full of rays and flat fish. MJ got chatting to a very helpful member of staff at this point, who pointed out the different rays and told us the story of Herbert the Turbot, a huge albino flat fish rescued from the sea by a fisherman who knew it would not survive without the means to camouflage itself on the sea bed. We waved goodbye to Herbert and carried on into the next room where the children were invited to stroke a starfish and hold a mermaid’s purse (a pouch for shark and ray eggs). 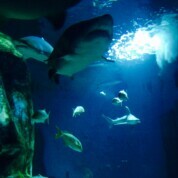 At this point you get your first glimpse of a huge tank containing rays, sharks, turtles and other huge fish. You can see the specimens from many different angles, including a tunnel with a glass ceiling. This tank and another enormous one containing some scary looking sharks form the centrepiece of the aquarium and you re-visit the tanks from different angles and floors as you navigate the rest of the building. The sharks and giant turtles may provide the big draw, but there are lots more species to see as you complete your journey through the aquarium. From terrapins, piranhas, huge catfish, a crocodile and a gallery full of crabs – there’s loads to see, and we even found Nemo. 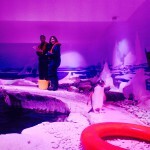 The final highlight is the Antarctic gallery where the boys were delighted to see some penguins before heading for home. 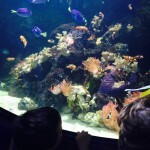 Sea Life London Aquarium is a great day trip destination for all ages – and, of course, especially for lovers of Octonauts and Finding Nemo (or Jaws for the adults – it’s impossible to resist humming the theme music as the sharks approach…). There was a special LEGO explorers event on when we visited and MJ loved spotting pieces of diving equipment made from LEGO in some of the Aquarium’s tanks. In our view, ticket prices mean that it’s a good option for a special occasion or school holiday treat rather than an everyday destination (look out for discounts, see below). Tickets cost £23.50 for adults and £16.95 for children over 3. Under 3s free. You can save up to 15% online. It’s also worth looking out for special offers e.g. 2-for-1 deals on the side of cereal boxes. We did not pay for admission on this occasion. 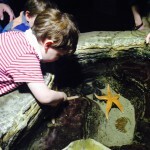 Sea Life London Aquarium is open Monday to Sunday 10am to 7pm (check opening times before you visit, as the Aquarium opens earlier in school holidays). 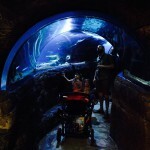 Sea Life London Aquarium is fully accessible to pushchairs and has baby changing facilities. Sea Life London Aquarium does not have a café, although there is a café and a McDonalds within the County Hall complex. By train: The closest stations are Waterloo (Bakerloo, Jubilee and Northern lines, National Rail), Waterloo East (National Rail), Charing Cross (Bakerloo, Northern lines, National Rail), Embankment (Circle and District lines), Westminster (Jubilee, Circle and District lines). By bus: A large number of buses stop in Westminster Bridge Road and at Waterloo.